We have been reading about a lot of rogue software targeting Mac users – but its now time for Firefox users to be very careful. A new scareware detects your user-string from your browser and if you are using Firefox, it will display a fake alert stating that a security scan is in process, with a button recommending that you Start Protection.If you click on the Start Protection. button, it will proceed to install a rogue antivirus software on your Windows computer. 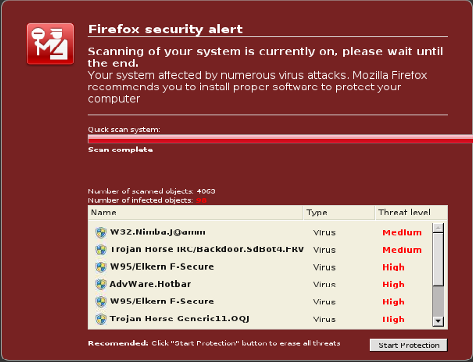 Firefox does NOT include a virus scanner, so should you see such an alert, you know what to do! Simply close the browser and make it a point to not visit the website where you may have seen this alert, reports Sophos. If you use Internet Explorer, you may get the regular Computer folder dialog box which appears to be running a system scan inside your IE. I guess we are going to be seeing more and more of such ways to steal money from people. 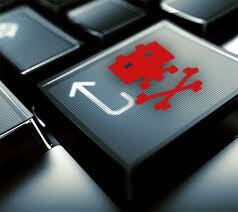 Cybercriminals will use such scareware tactics to scare people into downloading malicious software onto their computers and/or pay for a fake rogue software. This is something we all need to take care of.